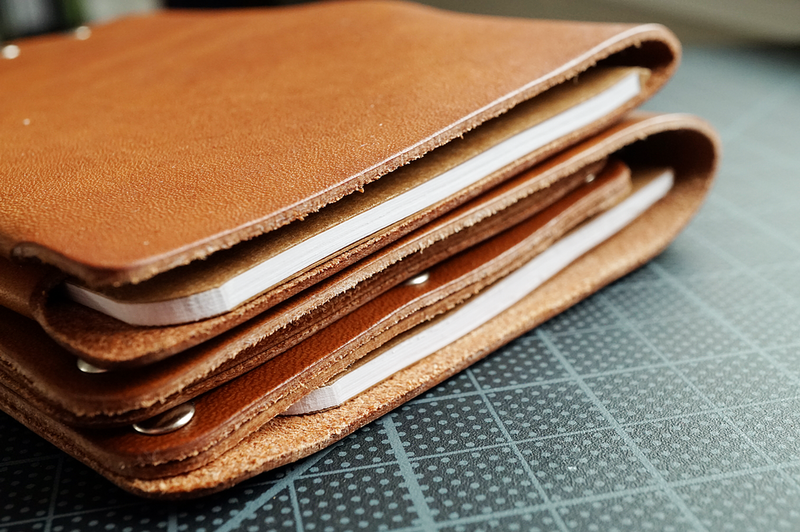 Whenever I learn of a new (well, new to me) leather maker I always get excited. Something that pairs nicely for daily, ongoing use in our world of stationery or every day carry items is leather. It is durable (when well made), ages in unique ways as it is used, and protects things we care about from being damaged. 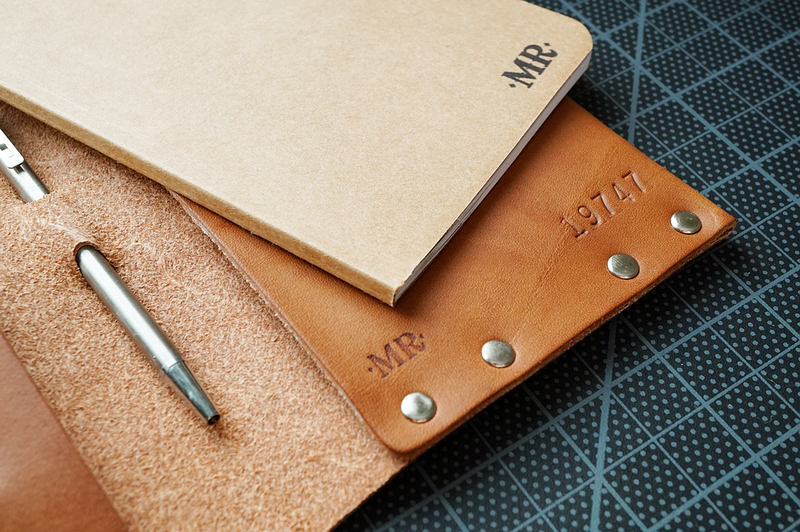 A company I was unfamiliar with called Mr. Lentz reached out to me and asked if I'd like to take a look at some of their leather passport/notebook wallets and, of course, I can never refuse to see someone's handwork. Mr. Lentz products are created by a real guy, Mr. Evan Lentz, who has been making and selling his wares for several years also being featured in several publications as well as being a featured Etsy seller. Needless to say, he seems to have garnered a reputation for care and quality in his work from a wide range of audiences. The Mr. Lentz brand and products have a very pronounced cowboy and country theme (although Evan does say he loves 90's dance music in his bio...which is awesome) that admittedly is a bit outside of my own personal aesthetic, but doesn't dissuade me in the least from appreciating and enjoying what he has created. Practical, attractive, and well-made goods are always appealing. Evan was kind enough to actually send me two different passport/notebook covers to review. Should we do a giveaway for one soon?... I think we just might. For his work Evan uses full-grain vegetable tanned leather purchased through one of the oldest US tanneries, and the leather is made from some of the toughest parts of the cow's hide making it highly durable. The leather the covers are made of isn't abrasive in any way (but also not soft/supple), but they are stiff and tough before their first use, waiting to be broken in. I requested the Western Brown dyed leather which is a nice chestnut color, but they can also be made in an un-dyed natural or dyed black. The color is uniform on the pieces themselves, but when comparing the two the colors are slightly different, one being darker than the other. I'm not a leather maker so can't attest to whether this is due to different dye batches, the original leather having a starting color, curing time?... Either way, this is not offensive to me as they aren't designed to be a set. Each of the covers also has multiple slots for debit/credit cards, ID's, or business cards. The double passport sleeve is designed to really be an all in one carry solution when traveling. Included with each cover is a small chrome ballpoint pen (really, really small) by a company called Derringer (maybe like the small gun?) that is tucked into two punched holes at the spine of the cover. For quick notes I could see this being a good solution, but I know one of the first things I'd do is stretch the holes out a bit more to fit a CH4 Space Pen (also know as the Shuttle Series), the slimmer cousin of the original AG-7 Space Pen flown on the Apollo missions. A little more expensive of a pen, but may be a longer term investment. Also included is a small passport sized lined notebook that would work great to get someone started with the cover. I love the fact that he takes the time to include these items. With every piece, Evan also sends along a small tin of his leather care balm, which is a really nice consideration. When thinking about the stationery community in general, only one concern with the notebook situation came up: size. Many of the pocket notebook brands (Field Notes, Doane Paper, Story Supply Co...) make a 5.5" tall book, while the covers are designed for a 5" book which means they stick out slightly during use. I didn't see availability for buying additional books through Evan, although, another notebook producer here in the US, Scout Books, has always used the 5" size so they are a perfect fit and would be my recommendation for refills. In the notebook only cover, the book can either be tucked into its little pocket and removed during use, or, the back cover can be slipped into the same "pocket" to allow it to be used in the cover. The double passport/notebook cover would likely require the removal of the book from the cover due to there being card sleeves on both sides. Still, keeping everything tidy during transport. Something unique to Evan's leather covers is them being fastened together with brass rivets rather than sewing the edges. This gives a completely different look to the pieces and does add some of the Western flair for sure. Again, not being a leather maker myself, I can't say whether stitching or rivets will last longer, but I suppose it depends on execution. A poor stitch job will unravel just like a poor rivet job will pop through. Regardless, I like that he has gone this route for his brand and his work is tight and of high quality. A special thanks to Mr. Lentz for sending these my way for review! Outside of notebook covers, Evan carries a wide range of other leather wallets, bags, and other accessories at reasonable prices. Definitely give his wares a look.